If you visit Prague, the magnificent ancient city in the heart of Europe, there are many places you simply must not miss during your sightseeing. The famous Astronomical Clock (in Czech called “Orloj”) in Old Town Square is definitely at the top of the “must see” list. This historical technical miracle was created in the 15th century, and its origin is surrounded by legends. According to the legend, it was built by Master Hanuš in 1410 and the city councillors in an effort to maintain the uniqueness of this wondrous machine, had him blinded so that he could not create anything similar ever again. Master Hanuš then allegedly broke the mechanism in revenge and it took a long time to make it work again. 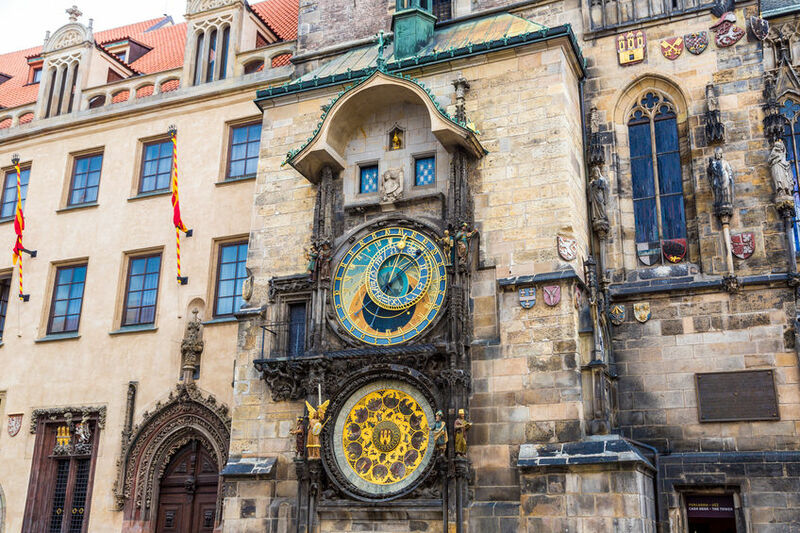 Whether the legend is true or not doesn’t change anything about the significance of the Old Town Astronomical Clock and its unquestionable beauty. For over six centuries, hundreds of thousands of tourists from all over the world have visited the Clock every year and patiently waited at the Old Town Square for the show to start. Every hour during the day the Astronomical Clock goes into action. Two windows open up to reveal twelve “travelling” apostles. On the sides of the clock a skeleton is ringing a bell, a Turk is shaking his head, and a miser is offering his purse full of money to Death in a bid to pay his way out of dying. The show ends with a golden rooster crowing and the huge bell at the top of the magnificent tower ringing. The Astronomical Clock, richly decorated by the best artists of the 15th century and working flawlessly for centuries, not only shows the date and time (Central European, Babylonian and Sidereal), but also tracks the position of the Sun and the Moon in the sky and displays various astronomical details. You can visit the Astronomical Clock anytime at the Old Town Square (Staroměstské náměstí) 1, Prague 1. It is near Staroměstská metro station. There is no entrance fee to pay. 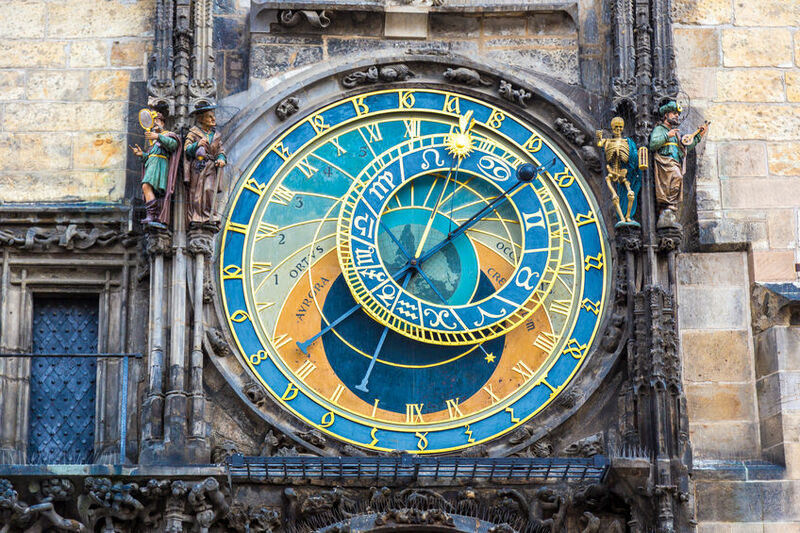 You can take a virtual tour of the Prague Astronomical Clock at http://www.360globe.net/prague/old-town/prague-astronomical-clock/view-from-above.html. 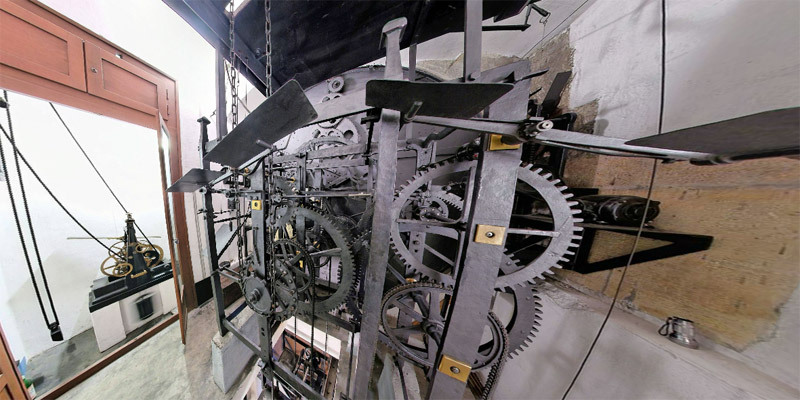 But even more interesting could be the virtual tour of the inside of the clock mechanism at http://www.360globe.net/prague/old-town/prague-astronomical-clock/main-machine.html. There is also an online live stream of the clock at http://www.earthcam.com/czechrepublic/prague/?cam=grandhotel_str. Unfortunately the quality is quite low but at least you can gain an idea about the atmosphere of the place.